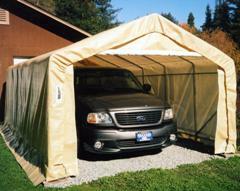 MDM Products offers two sizes of heavy duty open sided Steel Carports. Select either the larger 12x20 car size unit or the smaller, shorter 7x10 unit to fit your needs. These units are high quality protection from the effects of sun and weather for cars, trucks, machinery, recreational equipment or just about anything else that requires outdoor protection. The units feature a fabricated pre-drilled frame assembly of heavy square tube steel with all the hardware necessary for easy and instant erection in a matter of minutes. The frame is finished with a heavy powder coated finish of grey. The top roof material is fluted steel sheathing, shipped in pre-cut sheet lengths, with a baked-on neutral color painted finish. The steel panels resist rust, oxidation, or any amount of the sun’s damaging effects. The roof sheets easily attach to the frame assembly with rubber grommetted self-drilling screws at each frame member. Ends and sides are open to allow ventilation around whatever is placed underneath. The outer edge molding pushes directly onto the steel for a permanent, finished, and attractive edge. The base of each frame member is pre-drilled to insert the provided ground anchors. The anchors are 18” long steel pins with a large head, which are suitable to secure the carport to almost any surface. Once assembled, the unit is a permanent structure that will provide many years of protection for your valuable investments! Standard End Size Center Height - 8'5"